This will be short and sweet. There’s not much to say about this week’s recipe selection for French Fridays with Dorie: Vanilla Vegetable Salad. 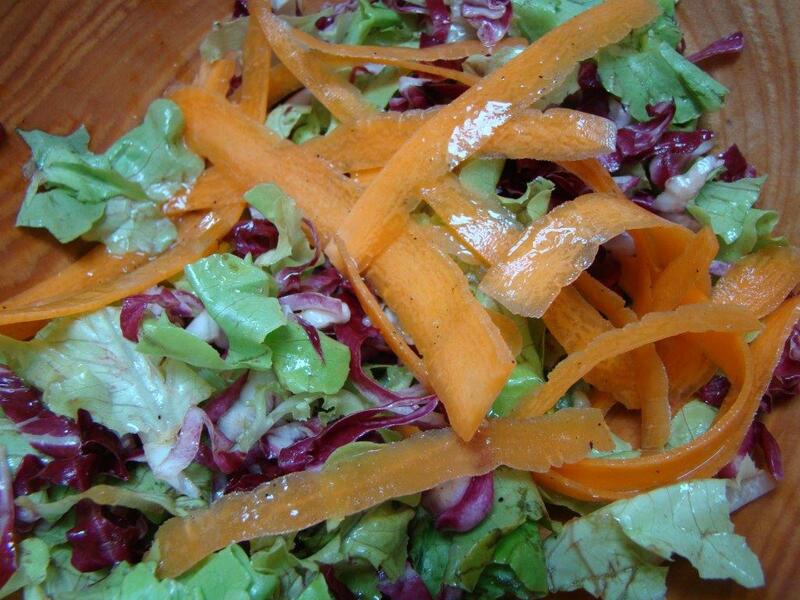 This is a very simple salad made interesting by an intriguingly exotic dressing. It’s just some mixed greens topped with long ribbons of carrots. (I don’t like raw squash, so left that out.) The surprise in this recipe is the vanilla extract in the lemony vinaigrette. The vanilla flavor is there, but isn’t too strong, so it’s not cloying. It provides a touch of mystery. I had this salad for lunch along with a mini zucchini gratin. I liked it, but it didn’t knock my socks off so I doubt I’ll make it again. To see what the other Doristas thought, check out their links here. Happy Friday!